CONMEBOL has confirmed that the 2020 edition of the Copa America tournament will be hosted by Argentina and Colombia. With the announcement of the co-hosts, the organization has brought several changes to the famous tournament. The new format splits the tournament into two zones, the North and South. Each zone will have six teams, including a special guest that’s not been announced yet. The North zone will have these teams: Peru, Ecuador, Venezuela, Colombia, Brazil and the guest. The South zone with have these teams: Chile, Argentina, Paraguay, Uruguay, Bolivia and the guest. Two teams from each zone will qualify to the next stage of the tournament. The new format will bring 12 more games to Copa America. 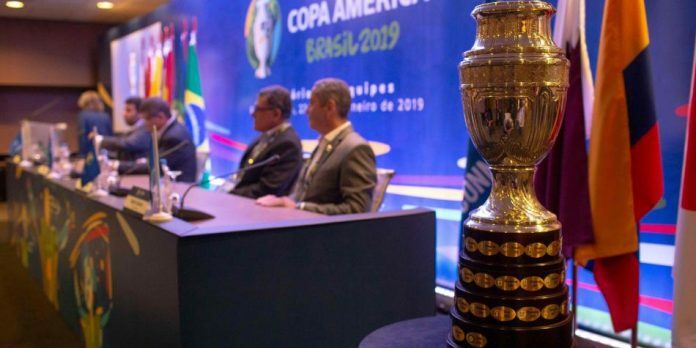 The 2019 Copa America, which will be held in Brazil, will have the old format. CONMEBOL President Alejandro Dominguez explained the decision, saying that the main objective was to make it easier for the fans and make the matches geographically closer to the public. Ernesto Lucena, director of Coldeportes, recently spoke to Carrusel Caracol and proposed that the final of the tournament should be played at a neutral site. He suggested that the final match should take place in a country between Colombia and Argentina. At the time, the co-hosts had not been confirmed for the 2020 Copa America. Reports say Colombia was also interested in hosting the tournament alone. The South American nation has only hosted the tournament once. Argentina has hosted several Copa Americas, including the 2011 edition. Colombia’s plan is to host games in cities such as Medellin and Bogota. Argentina is thinking of hosting games in Mendoza and Buenos Aires. Colombia and Argentina have just a little over one year to prepare for the football tournament, which was held in the US in 2016 to celebrate its 100 years. Colombia hosted its only Copa America back in 2001, winning the tournament after a great run in which they didn’t allow any goals. Argentina hosted the tournament in 2011 and its national team has appeared in the last two finals in 2015 and 2016. The two matches were won by Chile. Argentina will be co-hosting the tournament with Colombia but this could be considered as some preparation of what might come in less than 11 years. The South American nation has confirmed a bid for the 2030 World Cup. The bid will include three other countries, Paraguay, Uruguay and Chile. The South American bid is seen as a strong competitor since it has the ingredient of Uruguay hosting the first ever World Cup in 1930. It will be 100 years of that tournament in 2030, making it a special occasion for them to host it. The 2030 edition could spark one of the most interesting bidding races ever. Reports have revealed that many countries are interested in hosting this edition, including China, Morocco, Spain, Portugal and England. The 2020 Copa America will be the 47th edition of this tournament. The tournament will begin on June 12, 2020 and end exactly a month later.